These tiny 1.2mm (16 gauge) Bioflex circular barbells (or horseshoes as they are sometimes called) have an internal diameter measurement of 6mm (1/4") and are made out of genuine clear Bioflex. 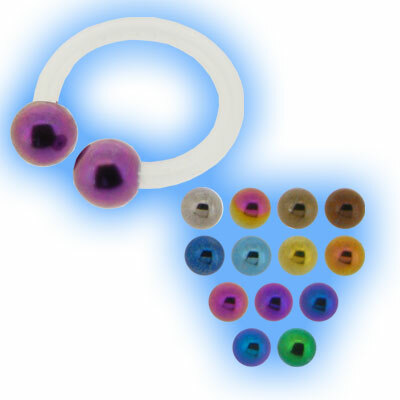 The balls are Grade 23 (6AL-4V ELi) Titanium and measure 3mm and are available in a choice of 15 Titanium colours. If you are looking for different sizes please have a look at our Bioplast Circular Barbells.